TICONDEROGA steams on, unruffled by Kamikaze's near miss off Luzon. Later, off Formosa, two Japs scored hits. Navy gunners can't always hang up shut-outs and, sometimes, a Jap suicide plane slips through to score. Up to 18 July, a total of 19 U. S. Navy ships had been announced as struck by the honorable-ancestor-here-we-come pilots, and five had been announced as sunk. In sizing up this toll, also consider (a) the vast number of targets that our huge fleets offer as they conduct history-making amphibious operations and (b) the mounting number of enemy planes that are shot down. And, of course, when a Kamikaze hits the deck, he's done for, but in most cases the stricken ship is back in the line, blazing away, before very long. Notable among these scarred veterans who have licked their wounds and gone back to lick the enemy again are the rejuvenated old battlewagons USS Nevada and USS California, the proud Essex-class carriers USS Ticonderoga and USS Bunker Hill, the mighty 'Big Ben' Franklin, the venerable lady Saratoga, and the light cruiser Nashville. Soon to be back to fight another day are such gallant little warriors as the destroyers Newcomb, Laffey, Leutze, Hadley, Evans and others. Unwavering, unwearying crews have done the impossible as they battled blazes and nursed their limping ships back to safe ports; and tireless shipyard workers have wrought miracles patching up these heroic hulks in record time. For instance, the Saratoga, which had suffered seven direct hits by suicide planes and bombs off Okinawa, was repaired in less than two months at Puget Sound Navy Yard - although she was the most extensively damaged vessel that yard ever received (ALL HANDS, July 1945, p. 42. ) Bremerton's "civilian Navy" devoted 155,000 man-days to repair the Ticonderoga with breathless speed. Before she reached the drydocks, her major repair jobs already were under way. Such swift work has not been the exception, but the rule. Damaging of the Ticonderoga, Nevada, California, Newcomb and Leutze were all revealed last month within a space of 22 days, but they had been struck months apart and the information withheld for security. DD WILLIAM D. PORTER goes down by stern while small rescue ship stands by. She sank three hours after attack. RISING SUN Emblem carried by Kamikaze plane that hit USS Nevada near Okinawa is picked up by sailor as crew clears wreckage from battleship's deck. The California was struck 9 January during the pre-invasion shelling of Lingayen Gulf installations ; the Ticonderoga 21 January during the 3d Fleet's operations off Formosa; the Nevada 27 March off Okinawa; the Newcomb 6 April off Ie Shima; and the Bunker Hill 11 May near Okinawa. The fights for survival by the Ticonderoga and the Bunker Hill were almost identical as the courage of their crews was matched only by the brilliant seamanship of their officers. Just one minute after noon on 21 January, while her planes were lashing out at enemy installations on Formosa, the Ticonderoga was attacked by a single-engine Jap plane that zoomed out of the sun, through a cloud bank and onto the flight deck. The bomb penetrated and exploded between the gallery and hangar decks. Fierce fires erupted. 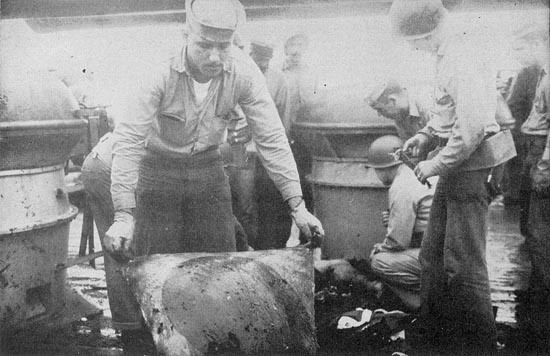 Magazines were flooded to prevent detonation of explosives, and other compartments were flooded to overcome the list to starboard and create a 10-degree list to port. This plan, devised by Commodore (then Capt.) Dixie Kiefer, USN, of Kansas City, Mo., and executed by his executive officer, Comdr. William O. Burch, USN, of Norfolk, Va., steadily carried the fire overboard because the gasoline floated on the water which the crew was pouring onto the flames. The water, carrying the gasoline on its surface, found free exit on the port side of the hangar deck forward. 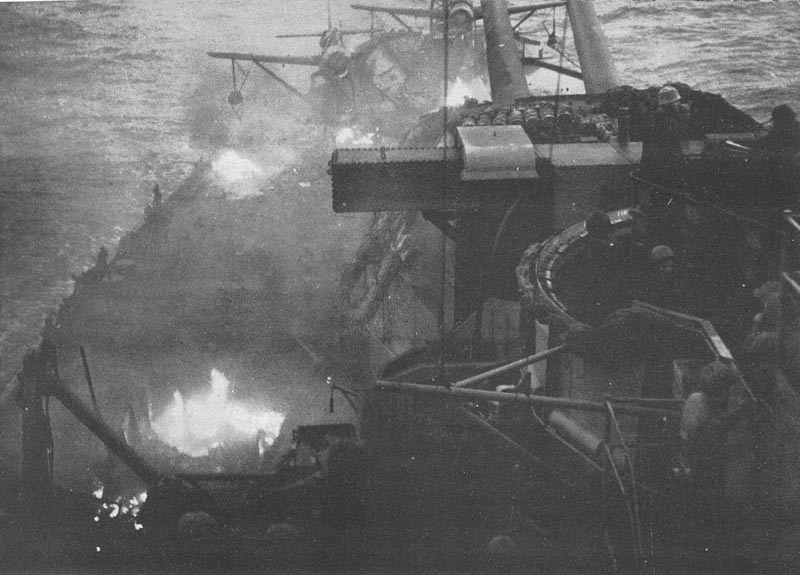 Even as the crew was battling the flames and jettisoning fire-menaced bombs and other ammunition overboard, other Kamikazes attacked. Five were shot down by the Ticonderoga's air group, three were blasted by the ship's ack-ack, but one got through to hit the carrier's superstructure just before 1300. But so furiously did the crew work and so effective was Commodore Kiefer's maneuver that by 1437 all fires were under control. There were 337 casualties, 144 of them killed or missing. In the case of the Bunker Hill - Vice Admiral Marc A. Mitscher's flagship - she was at flight quarters when enemy aircraft dived through her combat patrol and crashed onto the after half of the deck. Raging fires flourished. Then a Judy dropped a 500-pounder on the flight deck and crashed into the base of the island. As Admiral Mitscher was transferred in a boatswain's chair to the destroyer USS English to continue his direction of huge Task Force 58, the Bunker Hill's crew began a fight for her life that lasted for three agonizing hours. At times, it seemed the carrier could never survive. But the crew's valorous efforts were crowned with success when a sharp, skillful turn worked out by the navigator, Comdr. Charles J. Odend'hal Jr., USN, sent tons of water sluicing over the side, sweeping burning gas and oil overboard. The fires and explosions took 393 lives, wounded 264. But the Bunker Hill made port safely . . and, like the Ticonderoga, she'll be back. DESTROYERS withstood brunt of Kamikaze assaults at Okinawa. Above is the unsinkable Newcomb. 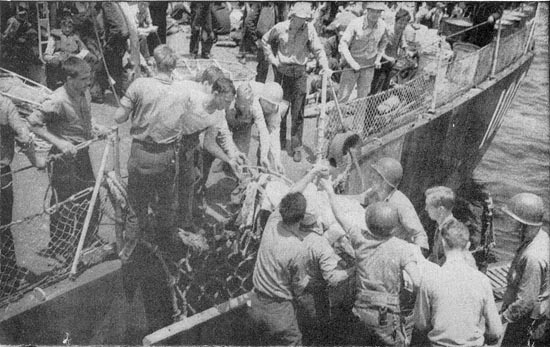 Below are survivors of the Evans on way to hospital ship. MINUTES AFTER ATTACK by a Jap suicide plane, the fantail of the Nevada was spotted with scattered gasoline fires. Firefighting parties had the flames under control, however, and gunners stood by to repulse other enemy attacks. beached at Pearl Harbor through Attu, Normandy, southern France and Iwo Jima. She had been straddled 27 times by German shore batteries during the bombardment of Cherbourg which led to that port's fall to American forces soon after D-day, but had come through unscathed. But, just before daylight at 0620 on 27 March, as the Nevada was preparing to obliterate enemy installations before the invasion of Okinawa, a formation of Jap planes attacked. The Nevada's antiaircraft gunners, old hands at this, splashed two. But a Val sneaked through the hazy light, headed for the open bridge. Light machine-gun slugs ripped his right wing off, diverted his course from the heavy superstructure and he hit the main deck aft near a main battery turret. Resulting fires were extinguished by damage-control parties in three minutes, but 11 had been killed and 49 wounded and considerable damage had been done. By 1030, however, she was back in the firing line. On 5 April, a Jap coastal battery unwisely chose to reveal her position and shoot it out with the old sea dog. The Jap gunners had the benefit of having ranged on the ship most of the day and they got in the first punches. They fired about 24 shells. Nineteen missed from 10 to 1,500 yards. But five scored, killing two and wounding 16. The engagement lasted only 16 minutes, but in that time the Nevada belched 71 rounds from the 14-inch main battery alone. When the smoke cleared, the target area resembled a blasted quarry. 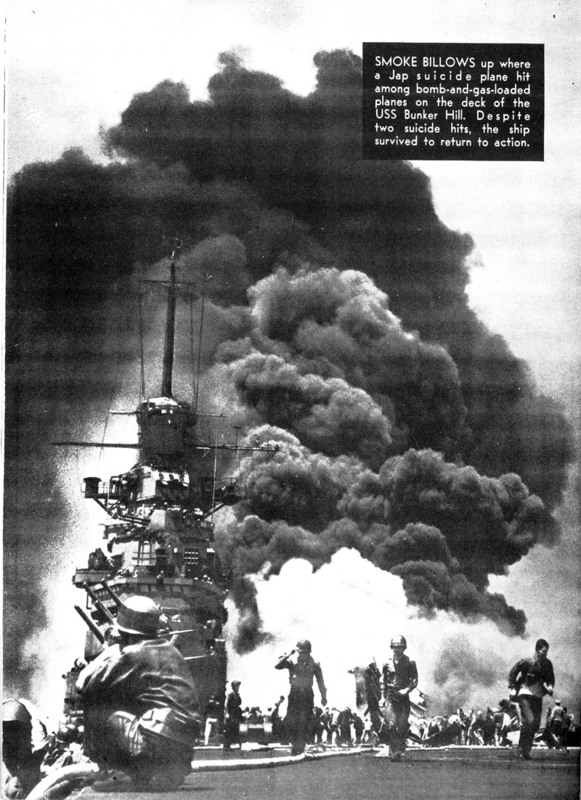 At Lingayen Gulf, the California's gunners got the first Kamikaze and seemingly had the second one. She was hit and appeared to be skimming over the ship, doomed to hit the water harmlessly. But she banked suddenly, roared in upside down and crashed against a tower. The fires were extinguished in 12 minutes. The California made temporary underway repairs and continued her assignments at Lingayen. Only when her chores had been completed did she head back for repair at Puget Sound. Gunners of the Newcomb had out-shot numberless suicide pilots at Mindoro, Lingayen Gulf and at Okinawa on earlier occasions. But on 6 April off Ie Shima, seven Kamikazers attacked within two hours and, although three were shot down, four hit. The seventh got a double - it skidded across the literally disemboweled Newcomb and crashed head on into the stern of the USS Leutze, which had come alongside to help fight her fires. 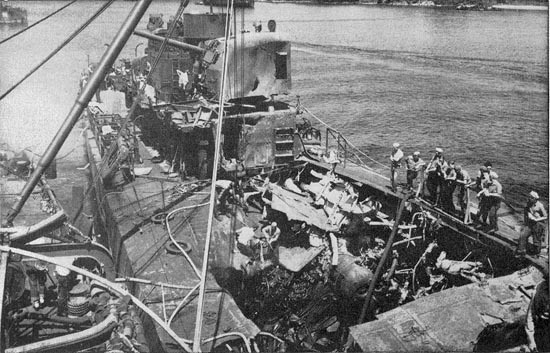 A total of 175 casualties were suffered on the two DDs. Aboard the Newcomb, 17 were killed, 54 wounded and 20 missing. The Leutze had two killed, 68 wounded and 14 missing. Only the heroic efforts of the Newcomb's crew-who fought with their hair aflame and their clothes burned off-kept the destroyer afloat and enabled the less-damaged Leutze to tow her to an advanced repair base. Sometimes, of course, no matter how hard nor how heroically a, crew may fight their ship is doomed. Such was the case with the USS William D. Porter, struck by a Kamikaze on 10 June off Okinawa. The wound was inflicted at the waterline on the starboard near the after engine room. Within seconds, the engine room and other compartments were flooded, and the ship listed heavily to starboard. For nearly three hours, the crew fought to save her, but the Porter continued to settle deeper into the water. The after deck was awash when the last man finally abandoned ship. No life was lost aboard the Porter and her 61 wounded were being treated aboard the hospital ship Relief before sunset.